Old Pine Street Presbyterian Church cemetery and north wall of the Presbyterian Historical Society, 2014. The First Presbyterian Church in Philadelphia holds a special place in the history of the faith. In an 1830 letter to Albert Barnes, Samuel Miller  of Princeton Theological Seminary called it “the mother of us all.” As the first Presbyterian church in Colonial America’s most Presbyterian city, it is the flagship church of early Presbyterianism. Little of the original church remains, in part owing to the congregation’s mobility though the years. Organized in 1698, First Church’s original home, known as “Old Buttonwood ,” was located on Market and Bank streets. After moves in 1820 to Seventh and Locust Streets and in 1928 to Fifteenth and Locust, it moved a fourth and final time to Twenty-First and Walnut Streets in 1949. Some of the few remnants of “Old Buttonwood” can be found at the Presbyterian Historical Society—in the form of tombstones embedded in our northern wall. How did the tombstones become literal parts of our building? When the First Presbyterian Church  moved from Market Street, it left behind a burial ground on Bank Street. When that plot was sold, more than 100 years of remains had to be removed and reinterred. That’s what happened between 1847 and 1848, when a mass grave in Laurel Hill Cemetery  became the new resting place for 1,500 souls. Today, beneath a monument commemorating the reinterred, a staircase leads to a crypt containing the ashes and bones of those bodies formerly buried beside Bank Street. "Here lie the remains removed from the burial ground of the First Presbyterian Church on Bank Street, 1847-1848." During the eighteenth century, the First Presbyterian Church had a second burial plot on Fourth and Pine Street in what was then a remote corner of Philadelphia. Part of that land became Third Presbyterian Church, which was erected from 1767 to 1768. By 1792, the Third Presbyterian Church had purchased most of the land at Fourth and Pine streets, though the First Presbyterian Church still owned the western end of the property, which it used as a burial ground. As bodies were being removed from Bank Street, 900 that did not go to Laurel Hill were reinterred next to Pine Street. Historical Property Map of (“Old Pine”) Third Presbyterian Church on Fourth and Pine Streets. Courtesy of Friends of Old Pine. In the 1840s, the burial ground on Pine Street was enclosed with a brick wall that the Third Presbyterian Church had built to replace a wooden fence local residents pilfered for firewood. To the south of the brick wall ran a small alley called Terror Street, which was eventually renamed Addison Street. Today, Addison Street runs intermittently west to east. 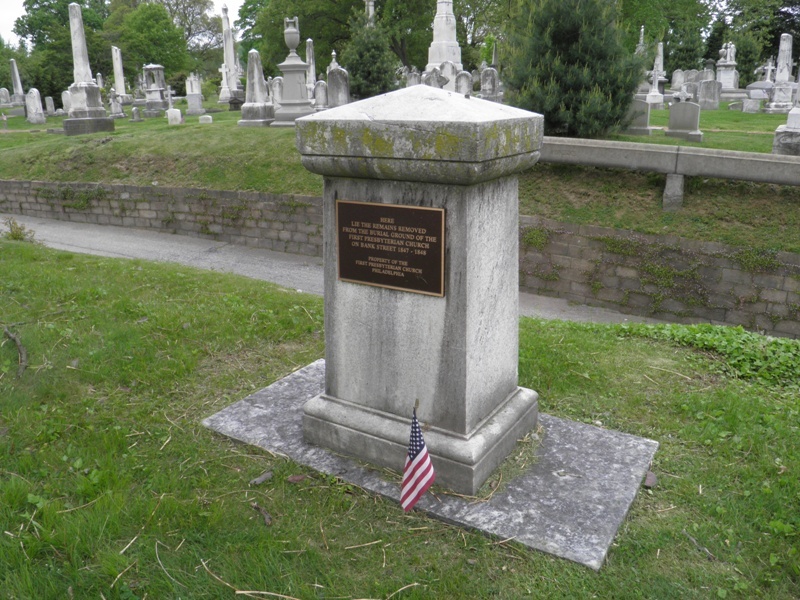 The plot owned by the First Presbyterian Church, which included 43 tombstones from the Bank Street burial ground, was eventually sold to the Third Presbyterian Church. In the early 1960s, when the Presbyterian Historical Society started looking for a new home, it purchased an abandoned lot behind the Third Presbyterian Church as the site of its new headquarters. During construction, the old south wall of the church cemetery was torn down and Addison Street became the rear of the Society’s new headquarters. To preserve the old tombstones, the architects decided to embed thirty of them—some more than 200 years old—in the northern wall of the new building. If you visit Bank Street today, between Market and Chestnut streets, you will find a small urban alleyway filled with apartment buildings, offices, and a nightclub. It’s hard to believe that this was once a green burial space for the city’s first Presbyterians. Luckily, part of that past is preserved in the walls of the Presbyterian Historical Society. 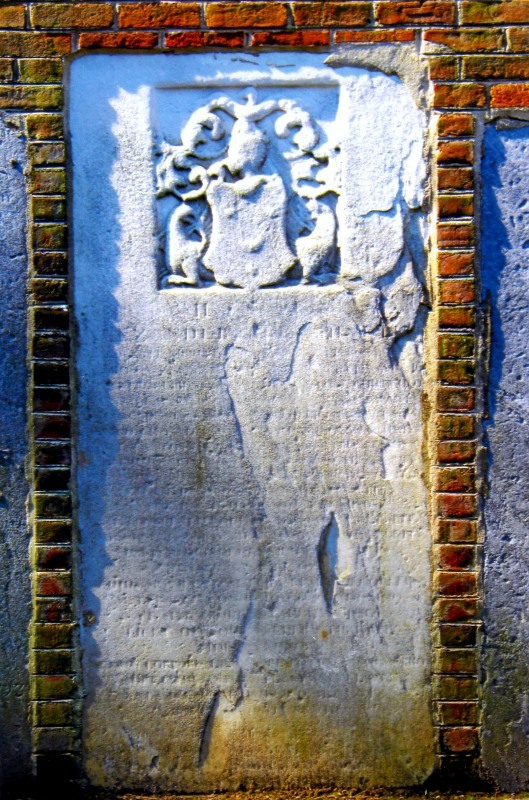 Tombstone embedded in wall of Presbyterian Historical Society, 2014.